A new Sony Ericsson slider phone was spotted in the wild today. Codenamed Yao, the Sony Ericsson W395 is a mid-range music phone from the Walkman line. Meanwhile, the handset previously known as Fillipa went on to join the Cyber-Shot family under the C901 tag. Some of the known features of the Sony Ericsson W395 include 2-inch display (176x220 pixels), dual speakers on the back of the phone, 2 megapixel camera with fixed focus, stereo Bluetooth v2.0 and of course M2 memory card slot supporting up to 8GB capacity cards. Traditionally for Sony Ericsson, the new baby won't feature a 3.5mm headphone jack. The Sony Ericsson W395 is expected to be announced in February/March. The expected price of the phone is still unknown. Sony Ericsson C901 on the other hand has been crawling the web for a long time. Now with the leaked official photos we might be able to throw some more light. This new Cyber-Shot phone features 5MP camera with auto-focus and xenon flash. Smile Shutter technology introduced in C510 is also onboard. Noble Black, Sincere Silver and Precious Peach are the three colors you will be able to choose from. 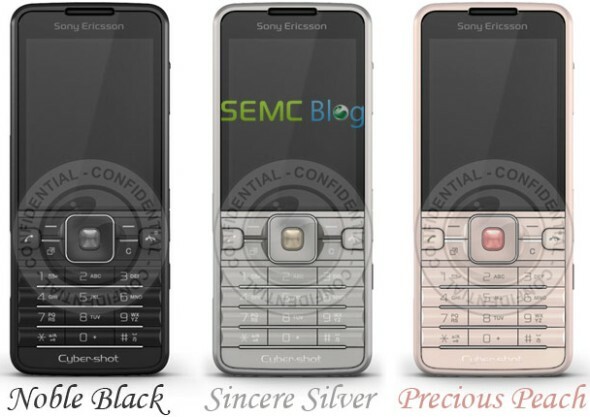 Sony Ericsson C901 must be announced on 15 February and is expected to hit the market in April. C901 Keypad reminds of Nokia 6233.